So far, outside of my roommate, Amit, getting what they call “Kabul Crud” (essentially a 24-hour bug), all is going smoothly. As of Monday night (Kabul time), we are ahead of schedule. Tomorrow begins a full day of training, which will be a struggle running on limited sleep. Interestingly, today is the Afghanistan New Year. As I understand, it is the celebration of “Nawroz” (New Year). For Afghans, it is considered the third largest holiday. Afghans are prepared to welcome the arrival of grass, flowers, trees, birds and the reawakening of nature and the season of spring. For Afghans, the celebration of Nawroz means that everything and everywhere shall be cleaned and renewed; washing clothes, cleaning the house, carpets, doing their best to throw away the problems belonging to the previous year. The festival is traditionally celebrated for 3 days. For the US military, it traditionally brings several attacks into the region. Therefore, the army base in Kabul is in “lockdown”. This means that there is heightened security, no transports to/from the airport and we cannot even cross the road to the other side of the base. There has also been frequent fly overs by black hawk helicopters. Fortunately, there are no incidents to report. We were told that in case of any emergency, we will be instructed to head to the nearest bunker, which in my case, is about 15 yards away (see picture). 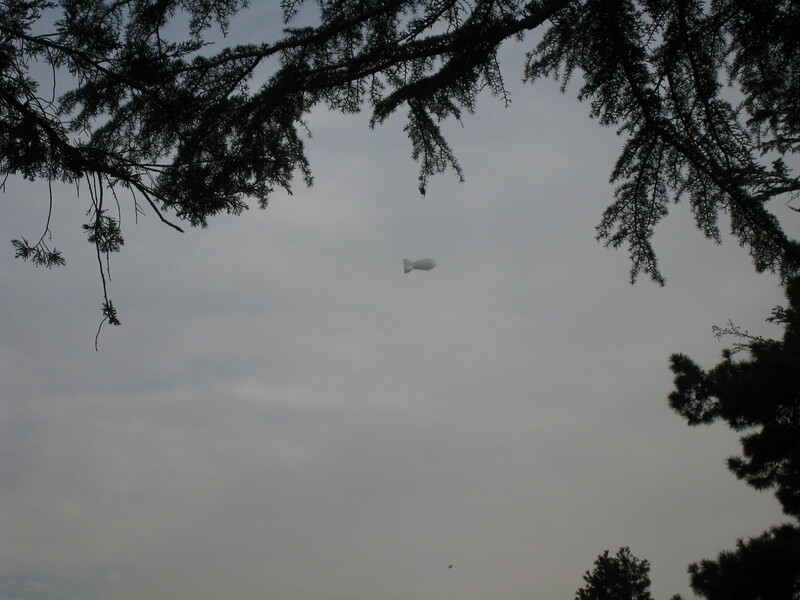 We also noticed what appeared to be a blimp flying overhead. In talking to one of the USACE civilians, it is called an Observation Balloon. It has radar detection that is monitored from a command center (location unknown) and can detect any kind of ‘activity’. I was told that it has stopped several insurgent attacks in the past. 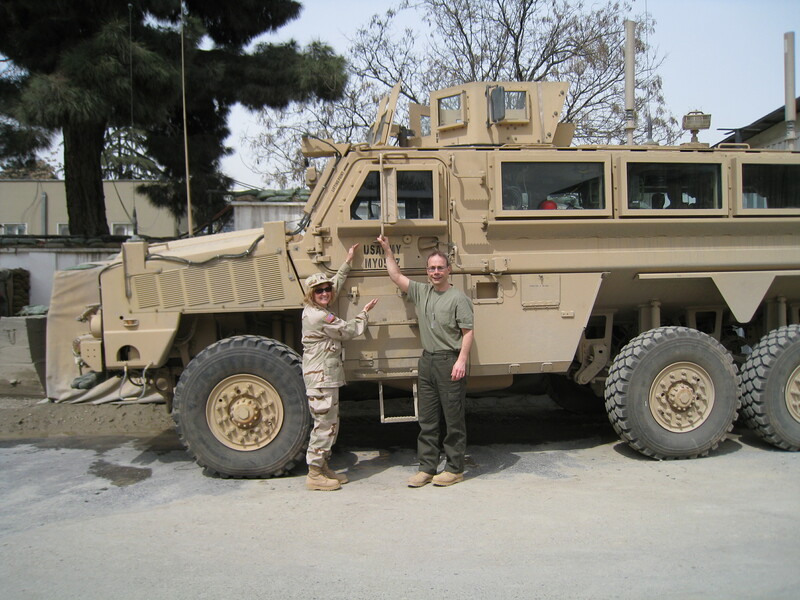 One last picture, which is the ‘MRAP’ or Mine Resistant vehicle. It is supposed to be impervious to land mines or IEDs, even if it runs over them. Apparently the bottom of the truck is a reinforced “V” shape, which will deflect a blast outward instead of upward. All things being equal, I’ll just take their word. So we have made it into Afghanistan and safely onto the base in Kabul. It was an incredible trip. First, we flew directly into Dubai, which was about as smooth and comfortable as a 13 hour flight could be. The view coming in was beautiful as we crossed over part of the Alps and the Mediterranean Sea. We left Washington at 10:30pm Thursday and arrived at 7:40pm on Friday. That was the first time that I ever lost a day traveling. We really only had time in Dubai to freshen up, grab a quick drink and get some rest as we were leaving the hotel at 9:00am for the airport. Flying into Afghanistan on Safi Airlines, I can understand why we can’t find Osama Bin Laden. The mountain ranges are steep, jagged, rural and huge. The airport did not appear to have gates for the planes to pull up to, so they park them on the tarmac and bus everyone to the terminal. Many thoughts pass through my mind during the 2-3 minute drive as I’m pressed against a window looking out around the Kabul airport (see header photo at the top of the page). We made it through customs without incident, where we were met by two Afghan Nationals (who are employed by the US army) inside the terminal. We got together as a group and were escorted outside. While walking to our transport, we were told to “stop” and we noticed several Nationals communicating on their radios. As we looked around, you could see armed US military (and Afghan Nationals) taking sniper positions along the perimeter of airport roof, on the grounds and on top of several military vehicles. We had to wait about 10 minutes outside, with the military at the ready. It turns out that the President of Afghanistan, Hamid Karzai, was in the airport at the same time as us, walking just passed Joyce, one of the USACE employees I am here with (about 10 feet away from me). He and his entourage drove off in a military convoy under ‘watchful’ eyes. Once he left, we were escorted to our vehicles with armed US guards and instructed to put on full body armor and helmets (very surreal) while being briefed by the guards. They explained that while they were not expecting any issues, an attack “could” occur at any time. He went on to talk about the vehicles we were traveling in (two bulletproof Ford Excursions) and said, in the event of an attack, we were to remain inside (a…yea!). The drive to the base was only about 5 miles, but what a ride it was. It is depressed here, much like what you see on CNN. Mud shacks, destroyed buildings, chaos on the street, cars driving any which way and armed military at most intersections. It was an interesting sight. The base itself is like a fortress. High concrete walls, barbed wire, armed checkpoints and concrete barriers strategically placed that made driving like an obstacle course. All of this does make me feel very safe on the base. It’s fairly large – almost like a little town. The main part of the base, “Qalaa House”, is actually the former Iraqi embassy (see photo). We had dinner in the mess hall, which is open 24 hours, as is the gym. 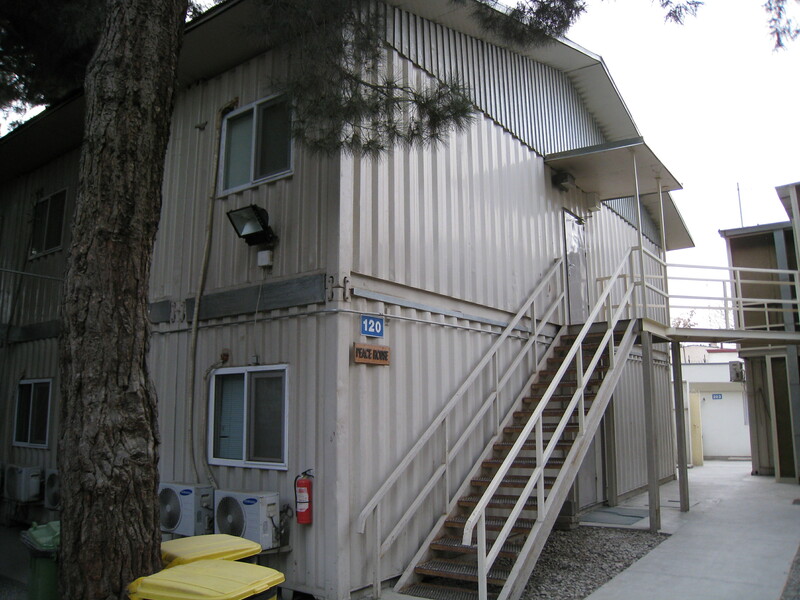 We got to our room (I’m sharing a room with the Amit, a USACE IT specialist), which is located on the second floor of the “Peace House” (see photo). It’s a very small room, much like a college dorm. There are probably 20 or so rooms on our floor, with approximately 8 bathrooms that we all share. We are off to the PX to shop as the army does not supply towels. 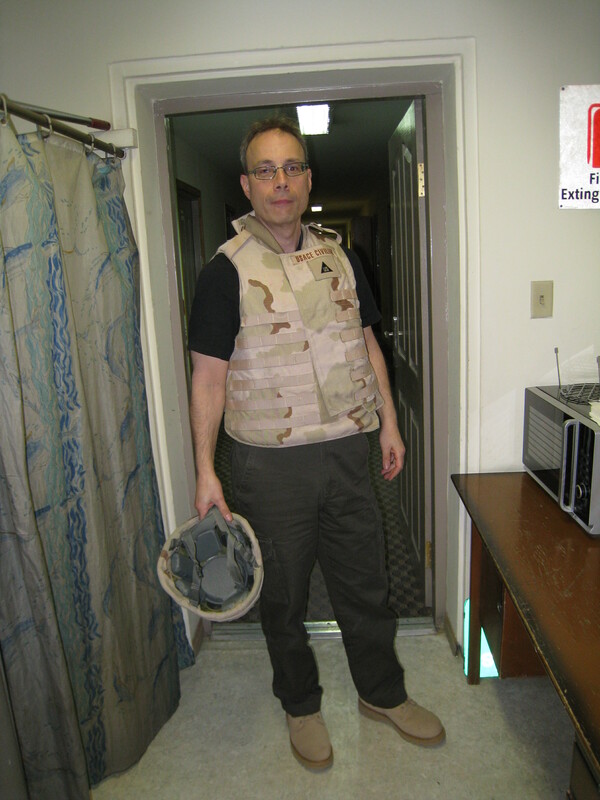 We do have to cross a street, so I have to wear full protective gear (see photo). I’ll write again in a couple of days. Sigh…my prescription lenses never arrived. Anyway, I have successfully completed the required UDC training, which means I can now officially travel to Afghanistan :-). 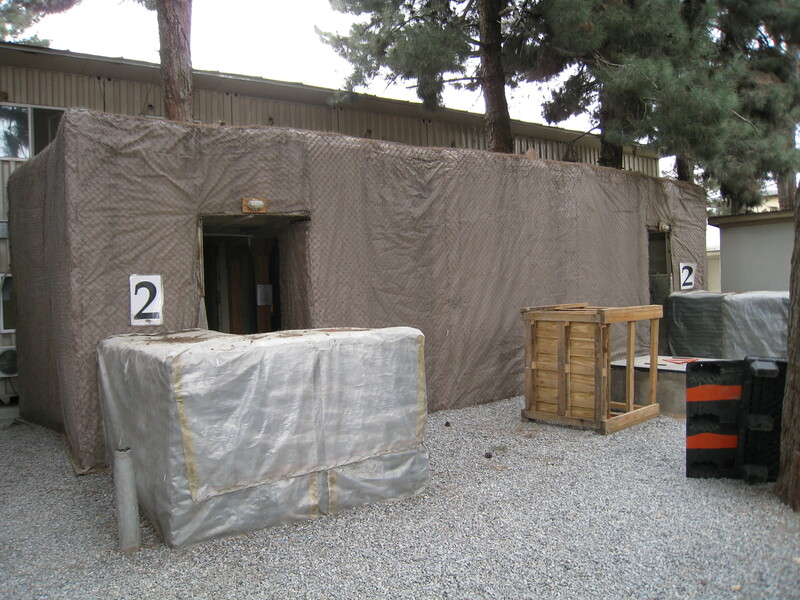 Seriously, there were times during the training that I found myself caught in the moment and I had to remind myself that while I am in Afghanistan I’m not leaving the bases, or as they say in the army, I am staying “inside the wire”. I must say that both the military staff that trained us and the students who attended the classes were all awesome. I wish everyone the best. There was a group photo taken, so here is our “graduating” class. Yesterday, we sat through a 2 hour ‘force protection’ (or more aptly, a terrorist) presentation from a Master Sergeant who was part Eddie Murphy and part Jamie Fox. He was, at times, very animated and funny. And other times, he was brutally (no pun intended) honest with the overall situation in Afghanistan and we all appreciated his candor. Towards the tail end of his presentation he included some very graphic footage from actual events that occurred in both Kabul and Kandahar. He announced to the group that we could leave the room as it wasn’t for the faint of heart (no one left). Let’s just say I won’t be stopping at any McDonalds (yes, they have them there) along the way. Wednesday afternoon was primarily a hands on triage lesson. We broke out into groups of four and we had to move through seven different medical situations that we could encounter. These included treating gunshot wounds, burns, heat related injuries, broken arms and legs, compound fractures and amputees. We learned about some of the latest bandage apparatus and how to apply them. There were 5 dummies used (no, I wasn’t one of them) and we practiced the two broken bone exercises (arm and leg) on a person in our group. Each group had 5 minutes to perform the tasks and we have to receive a “go” before we could move on to the next stage. I can only hope never to have to actually perform any of them. Training ended late Wednesday, so I was able to spend a good part of today working with a colleague of mine, Bobby, on the actual server work that I will need to do in both Kabul and Kandahar. 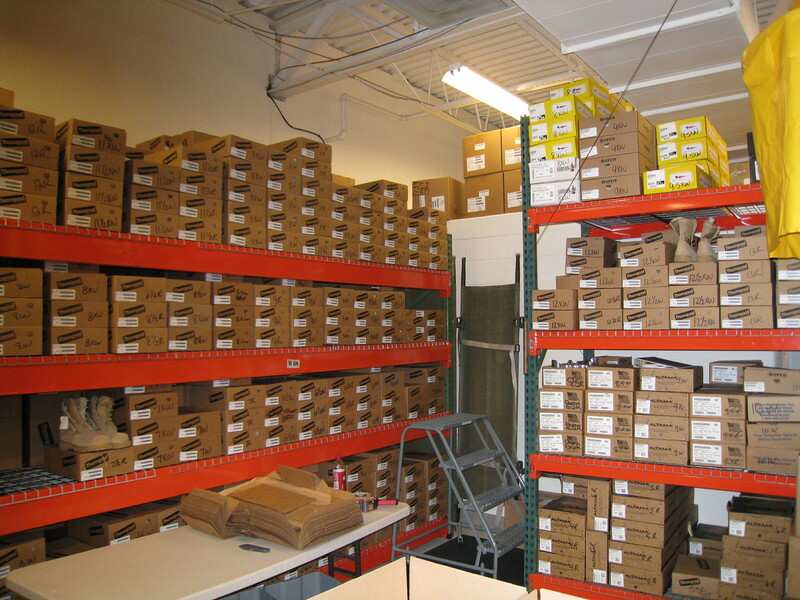 Bobby did an amazing job with the prep work, which should go a long way in helping with the overall software upgrade. Thanks Bobby! Well, gotta run for now. We are preparing to leave soon on the next leg of the trip, which will be the longest flight I’ve ever taken. 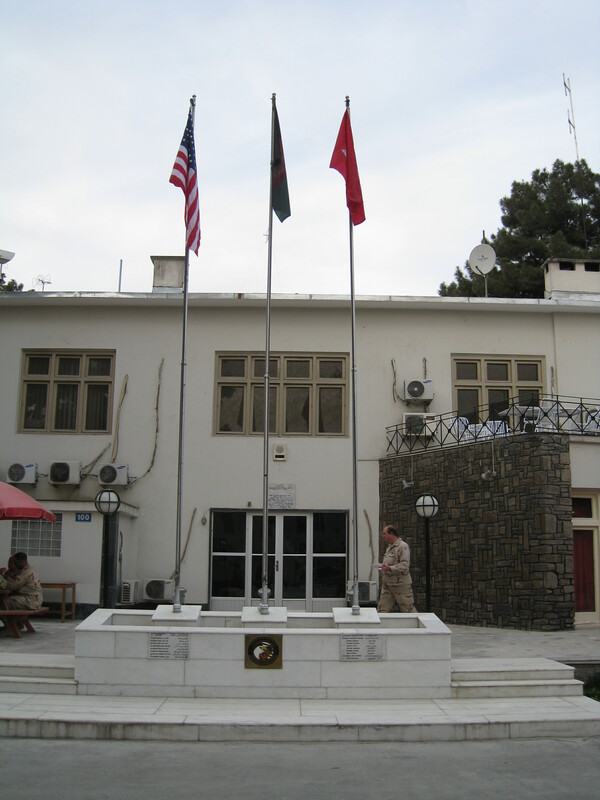 My next post will be from Afghanistan. Well, I’m here in Virginia receiving my training at the USACE UDC (Unit Deployment Center). There are approximately 35 people here this week (roughly 65% men) that are being deployed to several regions in the Middle East. Most are USACE civilians going over to perform a variety of tasks including engineering, construction, administration and even real estate (for the purposes of opening and closing army bases). 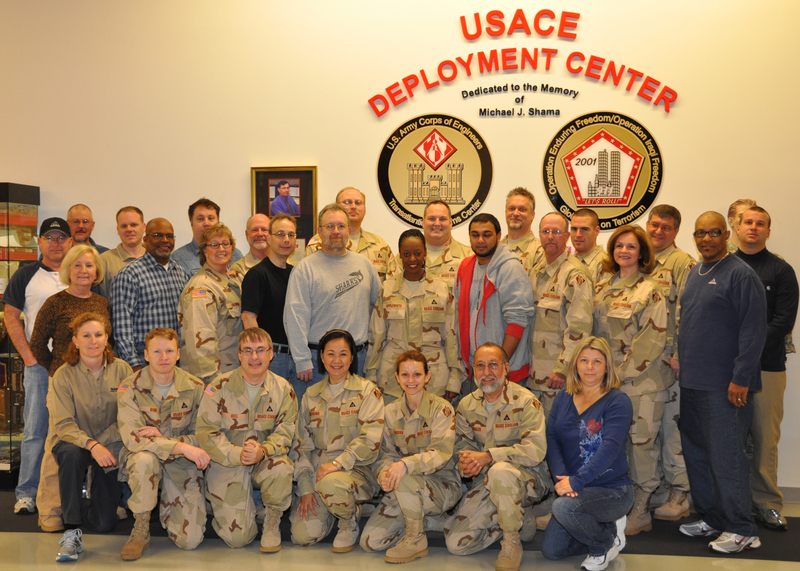 In addition to USACE personnel, there are several contractors like myself going overseas. I have certainly had an interesting week so far. On Monday, one of the first things we had to do was pickup our uniforms for the deployment. 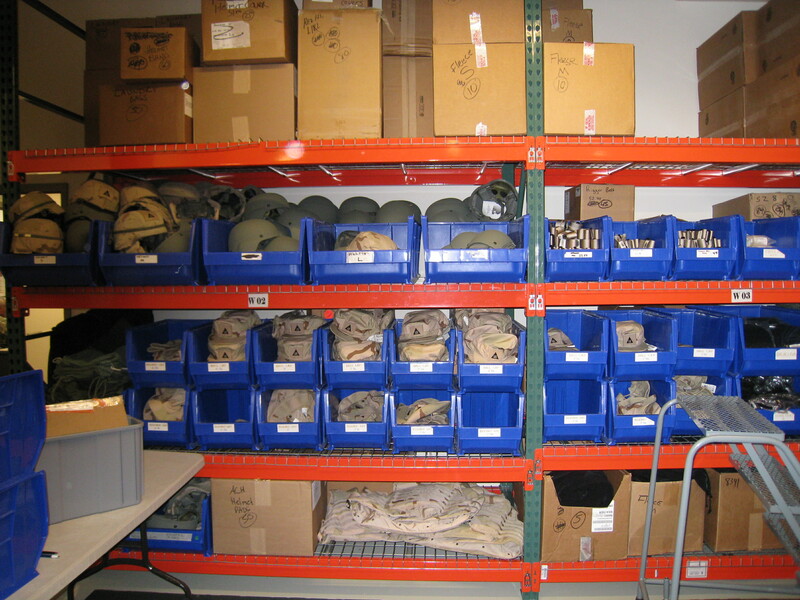 The UDC has a fairly large warehouse stocked with all sorts of gear including uniforms, boots, helmets, gas masks and vortex jackets (see pictures below). As I made my way to the front of the line, I was informed that since I was a contractor, I would be issued a helmet, gas mask, socks, boots, jacket and body armor (flak jacket), but no uniform. That’s fine, but I was told to pack ‘light’ and not bring too many articles of clothing because of strict weight restrictions when flying. So it was off to Wal-Mart to pick up some clothes! In addition, the prescription lenses for my ballistic goggles have not arrived. Anyone who knows me understands that I really can’t see beyond my nose without glasses, so hopefully they come in prior to Thursday. But I have my doubts. I also had to meet with medical on Monday. I was under the impression that we all had to give blood prior to deployment and again upon our return. This was so the army had a ‘before’ and ‘after’ sample of our blood, so they could determine if any medical disease realized after our return was contracted “in-country”. However, the army doctor said that I did not have to give a blood sample because my stay in Afghanistan was less than 15 days. I did need to receive an immunization for Typhoid and I have Doxycycline tablets that I need to take daily, which is the clinical term for anti-malaria medication. Sweet! As for the training itself, there have been several interesting sessions. One of the first was a presentation from legal regarding self-defense and ethics. Basically, the law of war for self-defense states that you can defend yourself (but not your property) if the threat is imminent and if it is against me. Further, the use of force has to proportional. Think of the old adage “an eye-for-an-eye”. Another presentation was how to detect an IED (Improvised Explosive Device). I find it amazing on how well concealed some of the IEDs are. They can be disguised as something as small as a can of soda or cigarette pack and can be detonated by many different types of electrical devices or simple pull cords. We also watched a video on hostage detention and how terrorists try to manipulate and coerce information from you. One presentation important to the actual work I will be performing was the army’s Information Assurance program. This basically outlined the do’s and don’ts with respect to computers. For example, no USB ‘jump’ (or flash drives) are permitted, mainly due to the spread of computer viruses. And if I want to plug-in my external hard drive to any army computer, it must be pre-approved by USACE IT and scanned for viruses prior to use (side note – the standard Bentley-issued WD drives are approved for use by USACE). Also, most peer-to-peer applications are not permitted. The best example I can give for this would be Skype. It’s not allowed. Another lesson was to understand how the gas mask works and learn the warning signs indicating a biological or chemical gas threat is imminent. In fact, one drill that we all had to perform (and pass) was how to properly put on a gas mask. As stated by one of the Sergeants in the training, if a warning siren is initiated, we have 9 seconds (yes, 9 seconds – gulp!) to put the mask on! Anything longer than 9 seconds…well, it’s not good. I needed a couple of kicks at the can for this, put I eventually got the hang of it. That’s all for now. I’ll post again prior to departing for Dubai. Welcome everyone to this site. As you now know, I am preparing to travel into Afghanistan with the US Army Corp of Engineers (USACE) to help assist with server installations and provide software training to USACE personnel stationed in the Middle East. I will be visiting two US Army bases; one in Kabul and the other in Kandahar (click the map below). As you might expect, the weeks leading up to the trip have included quite a bit of preparation. There are several USACE training courses that I need to complete before I can travel into Afghanistan. Most of these training courses have been made available to me on-line and cover areas I never thought I would be exposed to. Some of the subject material has included Anti-Terrorism, Subversion (which, I have learned, includes insubordination and disloyalty), Espionage (spying), Trafficking and Afghanistan cultural awareness, just to name a few. To say that some of these topics were very interesting is merely stating the obvious. In addition to the training material, there have been a few medical tests and immunizations that I needed to have prior to travel. Since the USACE categorizes this assignment as “short-term” (under 30 days), the medical (and training) requirements are not as stringent as a six-month or year-long deployment. So this meant fewer needles for Bill! Another interesting medical requirement was an eye exam. It appears that the Army is creating bullet proof eyewear (!) for me, presumably for when traveling to and from the Army bases. I guess I’ll learn more about this next week. My assignment does not immediately start in Afghanistan. 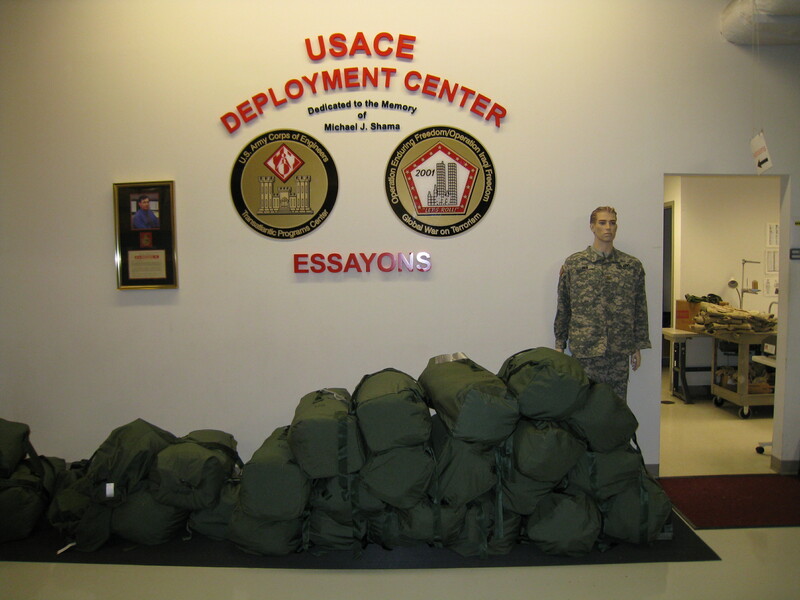 First, I will be traveling to the USACE office in Winchester, VA for additional training. While in Winchester, I will also be fitted for an Army uniform (including boots and a helmet), which I will be required to wear during my stay in Afghanistan. From Winchester, I leave with two USACE representatives for Dubai, UAE (a 13 hour non-stop flight from Washington, DC, in case you were wondering), which is an US entry and exit point for Afghanistan. We will stay one night in Dubai and then depart for Kabul. We will be in Kabul for approximately 5 days, then travel to Kandahar for another 5 days (transportation between Kabul and Kandahar is hopefully by air). On the return trip, I travel back through Dubai (from Kandahar), where this time I hope to stay an extra night and do some sightseeing. I plan on arriving back home in Toronto in early April. Starting next week, my goal is to provide a post approximately every two days. Look for my next post (and pictures) when I’m in Winchester.